Summary: The EzRun from DKN has a good set of features for the price. This is a bigger treadmill, with automatic incline up to 12%, a padded running surface and big console. You can use the EzRun in conjunction with the DKN iWorld app. This allows you to run on ‘courses’ from around the world. This model folds, which is a big plus for a quality / more robust model. Feedback has been positive across multiple outlets for this treadmill. See the full (impressive) gallery for yourself on this dedicated amazon.co.uk product page! Premium quality treadmill for serious training! Extra wide (52cm / 20.5") running belt with length of 140cm (55") provides ample space for even the tallest of users. True 1.75 HP continuous duty motor (3.5 HP Peak) provides a top speed of 20 km/h (12.5 mph). You’ll get a big, solid machine – much closer to the size you’ll find in the gym than it is to those flimsy budget models. The running belt is extra wide (at a full 52cm) and the 140cm length means taller users can run comfortably. The machine weighs in at a full 84kgs. This is 3x the weight of cheap treadmills. This type of machine is not a ‘wheel it in and set it up’ treadmill. You’ll want a dedicated space. Having a folding mechanism is unusual for a pro-level machine. The only other one I can think of which matches the spec and folds is this model from JTX. The top speed is 20km / hour – more than enough for even the tallest / fastest runners! This model comes 95% assembled, much easier to put together than many others I have covered here at Fitness Review. Automatic incline is a big plus. This makes running more varied and gives you a great cardio workout. The DKN EzRun has up to 12% incline. This is automatic, so you will not need to stop to reset the incline. This does mean you’ll have programs where you have this mid-session. Perfect if you are using the app to run on a course which has varied terrain. One thing you will certainly not find on cheap models is the cushioned running surface. The running belt is thick, giving better grip than on many models. A reason to choose this model is the full feature set. The electronics is a big plus. You get 25 pre-set workouts. Which are displayed on a backlit LCD console. These include workouts you can program for yourself. There are heart-rate controlled workouts too. This console lets you choose 2 user profiles. While you run your speed, pulse, distance, time and calories burned can be displayed. There is a safety key included. Finally, this console is Bluetooth compatible. This connects to your phone or tablet. You can use the DKN iWorld app to choose terrain / courses to run on and record your results / improvements. 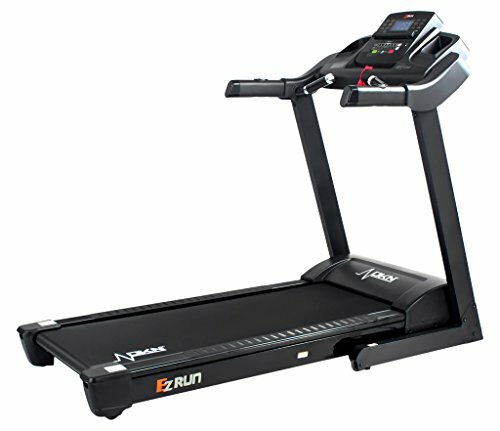 What Previous Buyers Said About the DKN EzRun Treadmill? At the time of writing there were only two reviews at Amazon, though other stores including Sweatband have more. These are universally positive. One thing that was mentioned several times was that this model is easy to put together. The size / robustness of the EzRun also came in for some praise. You’ll can check for more feedback and ratings on the dedicated amazon.co.uk product page. DKN have come up with a great mid-priced treadmill here. It is big, fully spec’d and even folds up between uses. For an incline treadmill with this many features, you are getting a lot of kit for the price. Try out the iWorld app along with the EzRun and keep your treadmill workouts fresh and varied with the automatic (motorized) incline. See the full gallery and impressive spec for yourself now over on this dedicated amazon.co.uk product page. Rowing vs Running - Which is Best?